Blogger's Note: Thanks to my family's pack-rat tendancies -- and my vanity -- I've managed to keep documentation of my progress as a writer from kindergarten on. Instead of letting those cedar chest gems go to waste, I figured I might as well do what I do best -- post them to my blog. 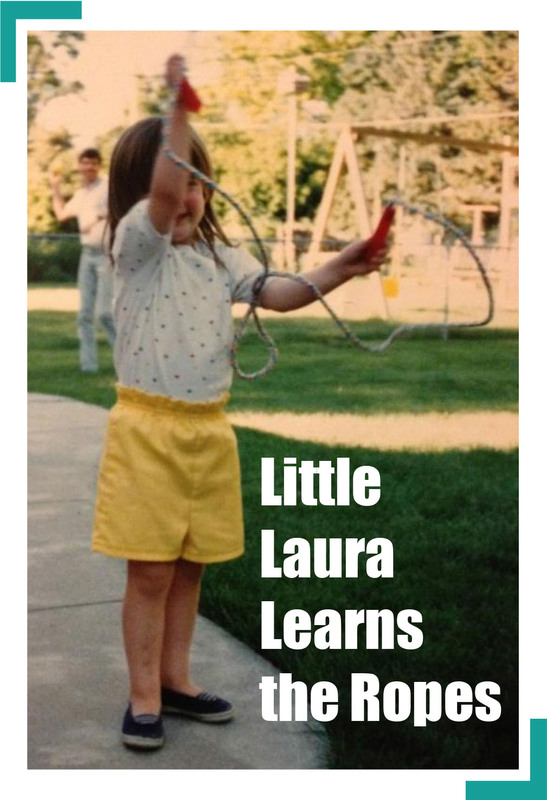 This is Little Laura Learns the Ropes. No. 11: Write a short story. Once upon a time, there was a very small mountain town called Rainbow. Why?, because there almost always is a rainbow. Wel, in this town there were four little girls, well they weren't really that little, they were 8 and 9, and in the 3rd Grade. They were all best-friends. Their names were Sarah, Morgan, Stephanie, and Elizabeth. They did almost everything together. The only thing that kept them apart was the fact that a river split them all apart. So every day they would row their boats over to Sarah's house. Once there they would decide what to do. Most of the time they went to the clubhouse. At the clubhouse they would play games like Twister, Monopoloy, and UNO, like most kids do, but their favorite was to use their imagination. I would tell you what they pretend, but, I don't know that, and besides that's another story. Holy run-on sentence, Batman! That first sentence in the second paragraph is almost as painful as your trite opener. "Once upon a time?" 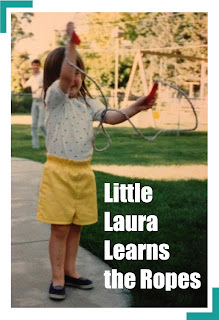 For serious, Little Laura? You're in sixth grade. You've made your way through most of the Baby-sitters Club and Little House series. You've graduated to reading biographies about Eva Peron and Maria Von Trapp. You should know better than to start a story with "Once Upon a Time." And you should know better than to include so many freaking ideas and clauses in a single sentence. Sheesh. Can we also talk about your not-so-shocking conclusion. Did you learn nothing from last week's story. Remember. The one where you also copped out with the ending and produced a story with no falling action. Hell, this one didn't even have a rising action. You may have improved your spelling and comma usage. But, Little Laura, the content is a little... lame. You wrote about nothing and plugged in your sister and her friends as characters. I know why. It's because you were given a sheet of paper with a couple of squiggles on it, told to draw a full illustration and write a story about it. You always hated writing prompts that stemmed from stupid lines on a piece of paper. By then, you'd kissed your art career goodbye, but you still had hope for your writing career. It's only natural you'd feel impatient with such as silly requests. From what I can remember, there were a bunch of squiggles and you used it to make a river. Amber: I thought it reeked. Cher: No, I believe that's your designer imposter perfume. Well said, Amber and Cher. This story was stanky.